The aggregate market value of the voting stock held by nonaffiliates of Ascent Capital Group, Inc. computed by reference to the last sales price of such stock, as of the closing of trading on June 30, 2011, was approximately $708 million. Series A common stock 13,470,323 shares; and Series B common stock 739,894 shares. The Registrants definitive proxy statement for its 2012 Annual Meeting of Stockholders is hereby incorporated by reference into Part III of this Annual Report on Form 10-K.
(a) General Development of Business On July 7, 2011, Ascent Media Corporation merged with its direct wholly owned subsidiary, Ascent Capital Group, Inc. (Ascent Capital or the Company), for the purpose of changing its name to Ascent Capital Group, Inc. Ascent Capital was incorporated in the state of Delaware on May 29, 2008 as a wholly-owned subsidiary of Discovery Holding Company (DHC). On September 17, 2008, DHC completed the spin-off of Ascent Capital to DHCs shareholders and we became an independent, publicly traded company. In the spin-off, each holder of DHC common stock received 0.05 of a share of our Series A common stock for each share of DHC Series A common stock held and 0.05 of a share of our Series B common stock for each share of DHC Series B common stock held. 13,401,886 shares of our Series A common stock and 659,732 shares of our Series B common stock were issued in the spin-off, which was intended to qualify as a tax-free transaction. At December 31, 2011, our assets consist primarily of our wholly-owned operating subsidiary, Monitronics International, Inc. (Monitronics), investments in marketable securities, real estate properties and cash and cash equivalents. At December 31, 2011, we had investments in marketable securities and cash and cash equivalents, on a consolidated basis, of $40,377,000 and $183,558,000, respectively. During 2010 and the beginning of 2011, there were substantial changes in our operations. Historically, our principal asset was our wholly-owned operating subsidiary Ascent Media Group, LLC (AMG). AMG was primarily engaged in the business of providing content distribution and creative services to the media and entertainment industries. The businesses of AMG were organized into two operating segments: businesses that provide content management and delivery services (Content Services), and businesses that provide creative services (Creative Services). The Content Services segment was in turn divided into three business units: (i) the content distribution business unit (Content Distribution), (ii) the media management services business unit (Media Services) and (iii) the systems integration business unit (Systems Integration or SI). On December 31, 2010, pursuant to a definitive agreement with Deluxe Entertainment Services Group Inc. (Deluxe) dated November 24, 2010, the Company completed the sale of 100% of its Creative Services business unit and 100% of its Media Services business unit (which is referred to collectively as Creative/Media), for an aggregate purchase price of $69 million in cash. Historically, the creative services business unit was a separate reportable segment and the media services business unit was included in the Content Services group reportable segment. The Company recorded a pre-tax loss on the sale of $27,110,000 and $7,587,000 of related income tax benefit for the year ended December 31, 2010. For further information regarding this transaction, see the MD&A section of this Annual Report. The Company has accounted for the disposition of the Creative/Media business as discontinued operations in the consolidated financial statements for all periods presented. On December 17, 2010, we acquired 100% of Monitronics, a leading national security alarm monitoring company. The transaction value comprised $397 million of cash consideration and we also assumed $795 million of net debt (which we define as the principal amount of such debt less Monitronics cash) of Monitronics. For more information about the Monitronics business, please see Narrative Description of the BusinessMonitronics International, Inc. below. The fiscal year 2010 financial statements of the Company included in this Annual Report on Form 10-K include the financial position of Monitronics in the Companys consolidated balance sheet as at December 31, 2010, and the results of operations of Monitronics on a consolidated basis for the period from December 17, 2010 through December 31, 2010. In February 2010, AMG consummated the sale of the assets and operations of its Chiswick Park facility in the United Kingdom, which was previously included in the Content Services group, to Discovery Communications, Inc., for net cash proceeds of approximately $35 million. AMG recognized a pre-tax gain of approximately $25.5 million from the sale. For further information regarding this transaction, see the MD&A section of this Annual Report. The results of operations of the Chiswick Park facility have been treated as discontinued operations in the consolidated financial statements for all periods presented in this Annual Report. As of June 30, 2011, the Company shut down the operations of the Systems Integration business. In connection with ceasing its operations, the Company recorded exit costs of $1,119,000 related to employee severance. For further information regarding this transaction, see the MD&A section of this Annual Report. The results of operations of Systems Integration have been treated as discontinued operations in the consolidated financial statements for all periods presented in this Annual Report. On February 28, 2011, we completed the sale of 100% of the Content Distribution business to Encompass Digital Media, Inc. and its wholly owned subsidiary (together Encompass). The Company received cash proceeds of approximately $104 million and recorded a pre-tax gain of approximately $66.1 million and related income tax expense of approximately $2.9 million. For further information regarding this transaction, see the MD&A section of this Annual Report. The results of operations of Content Distribution have been treated as discontinued operations in the consolidated financial statements for all periods presented in this Annual Report. · competitor and overall market response to our products and services including acceptance of the pricing of such products and services. · the ability of Monitronics to refinance its existing debt on attractive terms, or at all. Based on the foregoing criteria, and due to the sale of our Content Distribution business during 2011, we only have one reportable segment as of December 31, 2011. Ascent Capital Group, Inc., a Delaware corporation, is a holding company whose principal assets consisted of our wholly owned operating subsidiary, Monitronics International, Inc. (Monitronics), investments in marketable securities, real estate properties, and cash and cash equivalents as of December 31, 2011. Our principal executive office is located at 5251 DTC Parkway, Suite 1000, Greenwood Village, Colorado 80111, telephone number (303) 628-5600. The results of operations of our former Creative/Media business, Content Distribution business, and Systems Integration business have been treated as discontinued operations in the consolidated financial statements for all periods presented in this Annual Report. We are also currently exploring opportunities to dispose of or monetize our owned real property, which is not required for our operations. Through our wholly-owned subsidiary, Monitronics, we are primarily engaged in the business of providing security alarm monitoring services: monitoring signals from burglaries, fires, medical alerts, and other events, as well as, providing customer service and technical support. Monitronics is the third largest alarm monitoring company in the United States, with over 700,000 subscribers under contract. With subscribers in all 50 states, the District of Columbia, Puerto Rico, and Canada, Monitronics provides a wide range of mainly residential security services including hands-free two-way interactive voice communication with the monitoring center, cellular options, and an interactive service option which allows the customer to control their security system remotely using a computer or smart phone. Monitronics was incorporated in 1994 and is headquartered in Dallas, Texas. service providers, Monitronics is able to allocate capital to growing its revenue-generating account base rather than to local offices or depreciating hard assets. During 2011, Monitronics purchased alarm monitoring contracts from more than 375 dealers. Monitronics generally enters into alarm monitoring purchase agreements with dealers only after a thorough review of the dealers qualifications, licensing and financial situation. Once a dealer has qualified, Monitronics generally obtains rights of first refusal to purchase all accounts sold by that dealer for a period of three years. Revenue is generated primarily from fees charged to customers under alarm monitoring contracts. The initial contract term is typically three years, with automatic renewal on a month-to-month basis. Monitronics generates incremental revenue from retail customers by providing additional services, such as maintenance. Monitronics also generates revenue from fees charged to other security alarm companies for monitoring their accounts on a wholesale basis. 2. Dealer installs the alarm system, which is monitored by Monitronics central monitoring center, trains the customer on its use, and receives a signed three to five year contract for monitoring services. 3. Dealer presents the account to Monitronics for purchase. 5. Monitronics acquires the customer contract at a formula-based price. 6. Customer becomes a Monitronics account. 7. All future billing and customer service is conducted through Monitronics. · Confirmation that each security system has been programmed to Monitronics central monitoring station prior to purchase. paid by Monitronics. To secure the dealers obligation, Monitronics typically holds back a percentage of the purchase price for a 12 month period. Monitronics believes that this process, which includes both clearly defined customer account standards and a consistently applied due diligence process, contributes significantly to the high quality of its subscriber base. For each of its last seven calendar years, the average credit score of accounts purchased by Monitronics was in excess of 700 on the FICO scale. Approximately 94% of Monitronics subscribers are residential homeowners and the remainder are small commercial accounts. Monitronics believes by focusing on residential homeowners rather than renters it can reduce attrition, because homeowners relocate less frequently than renters. Monitronics provides monitoring services as well as billing and 24-hour telephone support through its central monitoring station, located in Dallas, Texas. This facility is Underwriters Laboratories (UL) listed. To obtain and maintain a UL listing, an alarm monitoring center must be located in a building meeting ULs structural requirements, have back-up and uninterruptable power supplies, have secure telephone lines and maintain redundant computer systems. UL conducts periodic reviews of alarm monitoring centers to ensure compliance with their requirements. Monitronics central monitoring station in Dallas has also received the Central Station Alarm Associations (CSAA) prestigious Five Diamond Certification. According to the CSAA, less than 4% of all central monitoring stations in the U.S. have attained Five Diamond Certified status. Monitronics also has a back-up facility located in McKinney, Texas that is capable of supporting monitoring, billing and customer service operations in the event of a disruption at its primary monitoring center. A call center in Mexico provides telephone support for Spanish-speaking subscribers. Monitronics telephone systems utilize high-capacity, high-quality, digital circuits backed up by conventional telephone lines. When an alarm signal is received at the monitoring facility, it is routed to an operator. At the same time, information concerning the subscriber whose alarm has been activated and the nature and location of the alarm signal are delivered to the operators computer terminal. The operator is then responsible for following standard procedures to contact the subscriber or take other appropriate action, including, if the situation requires, contacting local emergency service providers. Monitronics never dispatches its own personnel to the subscribers premises. If a subscriber lives in an area where the emergency service provider will not respond without verification of an actual emergency, Monitronics will contract with an independent third party responder if available in that area. Monitronics seeks to increase subscriber satisfaction and retention by carefully managing customer and technical service. The customer service center handles all general inquiries from subscribers, including those related to subscriber information changes, basic alarm troubleshooting, alarm verification, technical service requests and requests to enhance existing services. Monitronics has a proprietary centralized information system that enables it to satisfy over 85% of subscriber technical inquiries over the telephone, without dispatching a service technician. If the customer requires field service, Monitronics relies on its nationwide network of over 550 service dealers to provide such service on a time and materials basis. Monitronics closely monitors service dealer performance with customer satisfaction forms, follow-up quality assurance calls and other performance metrics. Monitronics also provides central station monitoring services on a wholesale basis for other independent alarm companies that do not have the capability to monitor systems for their customers. The Company has a registered service mark for the Monitronics name and a service mark for the Monitronics logo. It owns certain proprietary software applications that are used to provide services to its dealers and subscribers. Monitronics does not hold any patents or other intellectual property rights on its proprietary software applications. reputation with Monitronics high quality service and support, Monitronics is able to cost-effectively provide local services and take advantage of economies of scale where appropriate. Agreements with dealers provide for the purchase of the dealers subscriber accounts on an ongoing basis. The dealers install the alarm system and arrange for subscribers to enter into a multi-year alarm monitoring agreement in a form acceptable to Monitronics. The dealer then submits this monitoring agreement for Monitronics due diligence review and purchase. Dealer Network Development. Monitronics remains focused on expanding its network of independent authorized dealers. To do so, Monitronics has established a dealer program that provides participating dealers with a variety of support services to assist them as they grow their businesses. Authorized dealers may use the Monitronics brand name in their sales and marketing activities and on the products they sell and install. Monitronics authorized dealers benefit from their affiliation with Monitronics and its national reputation for high customer satisfaction, as well as the support they receive from Monitronics. Authorized dealers benefit by generating operating capital and profits from the sale of their accounts to Monitronics. Monitronics also provides authorized dealers with the opportunity to obtain discounts on alarm systems and other equipment purchased by such dealers from original equipment manufacturers, including alarm systems labeled with the Monitronics logo. Monitronics also makes available sales, business and technical training, sales literature, co-branded marketing materials, sales leads and management support to its authorized dealers. In most cases these services and cost savings would not be available to security alarm dealers on an individual basis. Currently, Monitronics employs sales representatives to promote its authorized dealer program, find account acquisition opportunities and sell Monitronics monitoring services. Monitronics targets independent alarm dealers across the U.S. that can benefit from the Monitronics dealer program services and can generate high quality monitoring customers for Monitronics. Monitronics uses a variety of marketing techniques to promote the dealer program and related services. These activities include direct mail, trade magazine advertising, trade shows, internet web site marketing, publicity and telemarketing. Customer Integration and Marketing. The customers awareness and identification of the Monitronics brand as the monitoring service provider is further supported by the distribution of Monitronics-branded materials by the dealer to the customer at the point of sale. Such materials may include Monitronics yard signs, brochures, instruction cards, and other promotional items. Monitronics dealers typically introduce customers to Monitronics in the home when describing Monitronics central monitoring station. Following the purchase of a monitoring agreement from a dealer, the customer is sent a brochure notifying them that Monitronics has assumed responsibility for all their monitoring and customer service needs. All materials focus on the Monitronics brand and the role of Monitronics as the single source of support for the customer. Negotiated Account Acquisitions. In addition to the development of Monitronics dealer network, Monitronics occasionally acquires alarm monitoring accounts from other alarm companies in bulk on a negotiated basis. Monitronics management has extensive experience in identifying potential opportunities, negotiating account acquisitions and performing thorough due diligence, which helps facilitate execution of new acquisitions in a timely manner. Ascent Capital actively seeks opportunities to leverage our strong capital position through strategic acquisitions in the security alarm monitoring industry as well as acquisitions in other industries. As part of this strategy, we divested the businesses that were historically operated by our former operating subsidiary, AMG, and acquired Monitronics, a subscription-based business that delivers solid, predictable revenue and cash flow and has what we believe is a scalable and leveragable business model. We consider acquisitions utilizing cash, leverage and potentially Ascent Capital stock. In addition to acquisitions, we consider majority ownership positions, minority equity investments and, in appropriate circumstances, senior debt investments that we believe provide either a path to full ownership or control, the possibility for high returns on investment, or significant strategic benefits. Maximize Economics of Business Model. Due to the scalability of our operations and the low fixed and variable costs inherent in our cost structure, we believe our Adjusted EBITDA margins may increase as these costs are spread over larger recurring revenue streams. We believe our cash flows may also benefit from our continued efforts to increase subscriber retention rates and reduce response times, call duration and false alarms. As used in this annual report, the term Adjusted EBITDA means earnings before interest, taxes, depreciation, amortization, realized and unrealized loss on derivatives, restructuring charges, and stock-based and other non-cash long term incentive compensation, and Adjusted EBITDA margin means Adjusted EBITDA as a percentage of revenue. · We are a reliable purchaser of accounts at competitive rates. For a description of the risks associated with the foregoing strategies, and with Ascent Capitals business in general, see Risk Factors section beginning on page 12. The security alarm industry has remained highly competitive and fragmented over time without any material change to market concentration. Competition in the security alarm industry is based primarily on reputation for quality of service, market visibility, services offered, price and the ability to identify subscriber accounts. We believe we compete effectively with other national, regional and local alarm monitoring companies due to our reputation for reliable monitoring, customer and technical services, the quality of services, and our low cost structure. The dynamics of the security alarm industry often favor larger alarm monitoring companies with a nationwide focus that have greater capital and benefit from economies of scale in technology, advertising and other expenditures. Some of these larger alarm monitoring companies have also adopted, in whole or in part, a dealer program similar to that of Monitronics. In these instances, Monitronics must also compete with these programs in recruiting dealers. We believe we compete effectively with other dealer programs due to our competitive account purchase terms and the quality of our dealer support services. The alarm monitoring companies that compete with Monitronics for alarm system dealers in this manner include ADT, which is significantly larger and has more capital. slight seasonal effect resulting in higher new customer volume and related cash expenditures incurred in investment in new subscribers in the second and third quarters. Monitronics operations are subject to a variety of laws, regulations and licensing requirements of federal, state and local authorities. In certain jurisdictions, Monitronics is required to obtain licenses or permits, to comply with standards governing employee selection and training and to meet certain standards in the conduct of its business. The security industry is also subject to requirements imposed by various insurance, approval, listing and standards organizations. Depending upon the type of subscriber served, the type of security service provided and the requirements of the applicable local governmental jurisdiction, adherence to the requirements and standards of such organizations is mandatory in some instances and voluntary in others. Monitronics alarm monitoring business utilizes telephone lines, internet connections, cellular networks and radio frequencies to transmit alarm signals. The cost of telephone lines, and the type of equipment which may be used in telephone line transmission, are currently regulated by both federal and state governments. The operation and utilization of cellular and radio frequencies are regulated by the Federal Communications Commission and state public utility commissions. At December 31, 2011, Ascent Capital, together with its subsidiaries, has approximately 689 full-time employees and an additional 33 employees that are employed on a part-time or freelance basis, all of which are located in the United States. request in writing to Investor Relations, Ascent Capital Group, Inc., 5251 DTC Parkway, Suite 1000, Greenwood Village, Colorado 80111. Telephone No. (303) 352-2039. · an unaudited pro forma condensed combined statements of operations for the nine months ended September 30, 2010 and the year ended December 31, 2009, giving effect to the acquisition of Monitronics and the dispositions of the Creative/Media and Content Distribution businesses, on a pro forma basis, as if such transactions had occurred on January 1, 2009.
statements included in the December 2010 report do not purport to represent, and are not necessarily indicative of, what our financial position or results of operations would have been had such transactions occurred on the dates indicated. We have a history of losses and may incur losses in the future. The primary AMG business unit, which was disposed of in February 2011, incurred losses in each of the five fiscal years preceding its sale, and Monitronics incurred losses in each of its last three full fiscal years. In future periods, we may not be able to achieve or sustain profitability on a consistent quarterly or annual basis. Failure to maintain profitability in future periods may materially and adversely affect the market price of our common stock. If we engage in any acquisition, we will incur a variety of costs, and may never realize the anticipated benefits of the acquisition. Our business strategy includes the future acquisition of businesses that we believe are strategically attractive and that we expect will be accretive to consolidated free cash flow. If we undertake any acquisition, the process of operating such acquired business on a stand-alone basis, or, if applicable, of integrating any acquired business with Monitronics, may result in unforeseen operating difficulties and expenditures. Moreover, we may fail to realize the anticipated benefits of any acquisition as rapidly as expected or at all. Future acquisitions could reduce our current stockholders ownership percentage, cause us to incur debt and expose us to liabilities. Further, we may incur significant expenditures and devote substantial management time and attention in anticipation of an acquisition that is never realized. Lastly, while we intend to implement appropriate controls and procedures as we integrate any acquired companies, we may not be able to certify as to the effectiveness of these companies disclosure controls and procedures or internal control over financial reporting within the time periods required by United States federal securities laws and regulations. foreseeable future, we may in the future require access to capital markets as a source of liquidity for investments and expenditures. In any such event, there can be no assurance that we would be able to obtain financing on terms acceptable to us or at all. If our ability to access required capital were to become significantly constrained, we could incur material borrowing costs, our financial condition could be harmed and future results of operations could be adversely affected. We may have substantial indemnification obligations under certain inter-company agreements we entered into in connection with the spin-off of our company from Discovery Holding Company (DHC), a subsidiary of Discovery Communications, Inc. Pursuant to our tax sharing agreement with DHC, we have agreed to be responsible for all taxes attributable to us or any of our subsidiaries, whether accruing before, on or after the spin-off (subject to specified exceptions). We have also agreed to be responsible for and indemnify DHC with respect to (i) certain taxes attributable to DHC or any of its subsidiaries (other than Discovery Communications, LLC) and (ii) all taxes arising as a result of the spin-off (subject to specified exceptions). Our indemnification obligations under the tax sharing agreement are not limited in amount or subject to any cap. Pursuant to the reorganization agreement we entered into with DHC in connection with the spin-off, we assumed certain indemnification obligations designed to make our company financially responsible for substantially all non-tax liabilities that may exist relating to the business of our former subsidiary, AMG, whether incurred prior to or after the spin-off, as well as certain obligations of DHC. Any indemnification payments under the tax sharing agreement or the reorganization agreement could be substantial. In addition, John C. Malone, a member of our board of directors and our largest shareholder in terms of voting power, beneficially owns shares of our common stock that represent approximately 30% of the aggregate voting power of our outstanding common stock. We have adopted a shareholder rights plan in order to encourage anyone seeking to acquire our company to negotiate with our board of directors prior to attempting a takeover. While the plan is designed to guard against coercive or unfair tactics to gain control of our company, the plan may have the effect of making more difficult or delaying any attempts by others to obtain control of our company in a transaction that our shareholders may find favorable. Holders of a single series of our common stock may not have any remedies if an action by our directors has an adverse effect on only that series of our common stock. Principles of Delaware law and the provisions of our certificate of incorporation may protect decisions of our board of directors that have a disparate impact upon holders of any single series of our common stock. Under Delaware law, the board of directors has a duty to act with due care and in the best interests of all of our shareholders, including the holders of all series of our common stock. Principles of Delaware law established in cases involving differing treatment of multiple classes or series of stock provide that a board of directors owes an equal duty to all common shareholders regardless of class or series and does not have separate or additional duties to any group of shareholders. As a result, in some circumstances, our directors may be required to make a decision that is viewed as adverse to the holders of one series of our common stock. Under the principles of Delaware law and the business judgment rule, holders may not be able to successfully challenge decisions that they believe have a disparate impact upon the holders of one series of our stock if our board of directors is disinterested and independent with respect to the action taken, is adequately informed with respect to the action taken and acts in good faith and in the honest belief that the board is acting in the best interest of all of our stockholders. Our Series B Common Stock trades on the OTC Bulletin Board, which is often characterized by volatility and illiquidity. The OTC Bulletin Board tends to be highly illiquid, in part, because there is no national quotation system by which potential investors can track the market price of shares except through information received or generated by a limited number of broker-dealers that make markets in particular stocks. There is also a greater chance of market volatility for securities that trade on the OTC Bulletin Board as opposed to a national exchange or quotation system. This volatility is due to a variety of factors, including a lack of readily available price quotations, lower trading volume, absence of consistent administrative supervision of bid and ask quotations, and market conditions. The potential for illiquidity and volatility with respect to our Series B Common Stock may also be exacerbated by the relatively small number of shares of our Series B Common Stock held by persons other than our officers and directors and the relatively small number of such unaffiliated shareholders. Monitronics faces risks in acquiring and integrating new subscribers. The acquisition of alarm monitoring agreements (AMAs) by Monitronics involves a number of risks, including the risk that the purchased AMAs may not be profitable due to higher than expected account attrition, lower than expected revenues from the AMAs or lower than expected recoveries from dealers when applicable. The purchase price Monitronics pays a dealer for an AMA is affected by the monthly recurring revenue generated by the AMA, as well as several other factors, including the level of competition, its prior experience with AMAs purchased from the dealer, the number of AMAs purchased, the subscribers credit score and the type of security equipment used by the subscriber. To the extent that the servicing costs or the attrition rates are higher than expected or the revenues from the AMAs or the recoveries from dealers, when applicable, are lower than expected, Monitronics business and results of operations could be materially and adversely affected. Monitronics is subject to credit risk and other risks associated with its subscribers. Substantially all of Monitronics revenues are derived from the recurring monthly revenue due from subscribers under the AMAs. Monitronics is therefore dependent on the ability and willingness of subscribers to pay amounts due under the AMAs on a monthly basis in a timely manner. Although subscribers are contractually obligated to pay amounts due under an AMA and are prohibited from canceling the AMA for the initial term of the AMA (typically three years), subscribers payment obligations to Monitronics are unsecured, which could impair the ability of Monitronics to collect any unpaid amounts from its subscribers. To the extent defaults by subscribers of their obligations under the AMAs are greater than anticipated, Monitronics business and results of operations could be materially and adversely affected. Monitronics relies on a significant number of its subscribers remaining with it as subscribers for an extended period of time. Monitronics pays a significant upfront purchase price for each new subscriber. It requires a substantial amount of time, typically exceeding the initial term of the related AMA, for it to receive cash payments (net of its variable cash operating costs) from a particular subscriber that are sufficient to offset this upfront cost. Accordingly, Monitronics long-term performance is dependent on its subscribers remaining with it as subscribers for as long as possible. This requires Monitronics to minimize its rate of subscriber cancellations, or attrition. Factors that can increase cancellations include subscribers who relocate and do not reconnect, problems with service quality, competition from other alarm monitoring companies, equipment obsolescence, adverse economic conditions and the affordability of its service. If Monitronics fails to keep the subscribers for a sufficiently long period of time, attrition rates would be higher than expected and Monitronics financial position and results of operations could be materially and adversely affected. Monitronics is subject to credit risk and other risks associated with its dealers. Under the standard alarm monitoring purchase agreement (AMPA) that Monitronics enters into with its dealers, if an AMA terminates its service with Monitronics during the first twelve months after the AMA has been purchased, the dealer is typically required to elect between substituting another AMA for the terminating AMA or compensating Monitronics in an amount based on the original purchase price of the terminating AMA. Monitronics is subject to the risk that dealers will breach their obligation to provide a comparable substitute AMA for a terminating AMA. Although Monitronics withholds specified amounts from the purchase price paid to dealers for AMAs (holdback), which may be used to satisfy or offset these and other applicable dealer obligations under the AMPA, there can be no guarantee that these amounts will be sufficient to satisfy or offset the full extent of the default by a dealer of its obligations under an AMPA. If the holdback does prove insufficient to cover dealer obligations, Monitronics is also subject to the credit risk that the dealers may not have sufficient funds to compensate Monitronics when substitute AMAs are unavailable or that any such dealer will otherwise breach its obligation to compensate Monitronics for a terminating AMA. To the extent defaults by dealers of their obligations under the AMPAs are greater than anticipated, Monitronics financial condition and results of operations could be materially and adversely affected. been monitored by Monitronics competitors. If macroeconomic conditions in the United States do not improve or materially worsen, Monitronics financial position and results of operations could be materially and adversely affected. Adverse economic conditions in States where Monitronics subscribers are more heavily concentrated may negatively impact Monitronics results of operations. Even as economic conditions may improve in the United States as a whole, this improvement may not occur or further deterioration may occur in the regions where Monitronics subscribers are more heavily concentrated (such as Texas, California, Florida and Arizona). Although Monitronics has a geographically diverse subscriber base, adverse conditions in one or more States where Monitronics business is more heavily concentrated could have a significant adverse effect on its financial position and results of operations. If the insurance industry were to change its practice of providing incentives to homeowners for the use of alarm monitoring services, Monitronics may experience a reduction in new customer growth or an increase in its subscriber attrition rate. It has been common practice in the insurance industry to provide a reduction in rates for policies written on homes that are covered by alarm monitoring contracts. There can be no assurance that insurance companies will continue to offer these rate reductions. If these incentives were reduced or eliminated, new homeowners who otherwise may not feel the need for alarm monitoring services would be removed from Monitronics potential customer pool, which could hinder the growth of Monitronics business, and existing subscribers may choose to disconnect or not renew their service contracts, which could increase Monitronics attrition rates. In either case, Monitronics results of operations and growth prospects could be adversely affected. Risks of liability from Monitronics business and operations may be significant. The nature of the services provided by Monitronics potentially exposes it to greater risks of liability for employee acts or omissions or system failures than may be inherent in other businesses. If subscribers believe that they incurred losses as a result of an action or a failure to act by Monitronics, the subscribers could bring claims against Monitronics, and Monitronics has been subject to lawsuits of this type from time to time. Similarly, if dealers believe that they incurred losses or were denied rights under the AMPAs as a result of an action or a failure to act by Monitronics, the dealers could bring claims against Monitronics. Substantially all of Monitronics AMAs and AMPAs contain provisions limiting Monitronics liability to subscribers and dealers, respectively, in an attempt to reduce this risk. However, in the event of any such litigation, no assurance can be given that these limitations will be enforced, and the costs of such litigation or the related settlements or judgments could have a material adverse effect on Monitronics financial condition. In addition, there can be no assurance that Monitronics is adequately insured for these risks. Certain of its insurance policies and the laws of some States may limit or prohibit insurance coverage for punitive or certain other types of damages or liability arising from gross negligence. If significant uninsured damages are assessed against Monitronics, the resulting liability could have a material adverse effect on Monitronics financial condition. Future litigation could result in adverse publicity for Monitronics. In the ordinary course of business, from time to time, Monitronics is the subject of complaints or litigation from subscribers, sometimes related to alleged violations of state consumer protection statutes, negligent dealer installation and negligent service of alarm monitoring systems. Monitronics may also be subject to employee claims based on, among other things, alleged discrimination, harassment or wrongful termination claims. In addition to diverting Monitronics management resources, adverse publicity resulting from such allegations may materially and adversely affect Monitronics reputation in the communities it services, regardless of whether such allegations are unfounded. Such adverse publicity could result in higher attrition rates and greater difficulty in attracting new subscribers on terms that are attractive to Monitronics or at all. communications facilities and backup power, among other safeguards. However, no assurance can be given that both of Monitronics monitoring facilities will not be impacted by a disruption, including one from a catastrophic event or natural disaster. Any such disruption, particularly one of a prolonged duration, could have a material adverse effect on Monitronics business. Monitronics relies on third parties to transmit signals to its monitoring facilities. Monitronics relies on various third-party telecommunications providers and signal processing centers to transmit and communicate signals to its monitoring facilities in a timely and consistent manner. These telecommunications providers and signal processing centers could fail to transmit or communicate these signals to the monitoring facilities for many reasons, including due to disruptions from fire, natural disasters, weather, transmission interruption, malicious acts or terrorism. The failure of one or more of these telecommunications providers or signal processing centers to transmit and communicate signals to the monitoring facilities in a timely manner could affect Monitronics ability to provide alarm monitoring services to its subscribers. There can be no assurance that third-party telecommunications providers and signal processing centers will continue to transmit and communicate signals to the monitoring facilities without disruption. Any such disruption, particularly one of a prolonged duration, could have a material adverse effect on Monitronics business. The alarm monitoring business is subject to technological innovation over time. Monitronics monitoring services depend upon the technology (both hardware and software) of security alarm systems located at subscribers premises. Monitronics may be required to implement new technology either to attract and retain subscribers or in response to changes in land-line or cellular technology or other factors, which could require significant expenditures. To the extent competitors of Monitronics have greater capital and other resources to dedicate to responding to technological innovation over time, the products and services offered by Monitronics may become less attractive to current or future subscribers thereby reducing demand for their products and services and increasing attrition over time. Those competitors that benefit from the capital available to them as part of an affiliated group of companies may be at a particular advantage to Monitronics in this respect. If Monitronics is unable to adapt in response to changing technologies, market conditions or customer requirements in a timely manner, such inability could adversely affect Monitronics business by increasing its rate of subscriber attrition. Monitronics also faces potential competition from improvements in self-monitoring systems, which enable current or future subscribers to monitor their home environments without third-party involvement, which could further increase attrition rates over time and hinder the acquisition of new AMAs. Shifts in customer selection of telecommunications services could adversely impact Monitronics financial condition. Monitronics operating model relies to some degree on its subscribers continued use of traditional, land-line telecommunications services, which Monitronics uses to communicate with monitoring equipment at the subscribers locations. Although Monitronics offers alarm systems that can communicate signals to the monitoring facility using various wireless and/or internet-based communication technologies, such solutions are presently more expensive than alarm communicators based on the traditional land-line network. In order to continue to service existing subscribers who cancel their land-line telecommunications services and to service new customers who do not subscribe to land-line telecommunications services, subscribers may be required to upgrade to more expensive technologies. Higher costs may reduce the market for new customers of alarm monitoring services, and the trend away from traditional land-lines to alternatives may mean more existing subscribers will cancel service with Monitronics. Continued shifts in customer preferences regarding telecommunications services could have a material and adverse impact on Monitronics subscriber attrition rates and financial condition. management and other experienced employees or replace them satisfactorily to the extent they leave the employ of Monitronics. The loss of any such experienced employees services and expertise could materially and adversely affect Monitronics business. The high level of competition in Monitronics industry could adversely affect its business. The security alarm monitoring industry is highly competitive and fragmented. As of December 31, 2011, Monitronics was the third largest alarm monitoring company in the United States when measured by the total number of subscribers under contract. Monitronics faces competition from other alarm monitoring companies, including companies that have more capital than it has and that may offer higher prices and more favorable terms to dealers for AMAs purchased or charge lower prices for its monitoring services. Monitronics also faces competition from a significant number of small regional competitors that concentrate their capital and other resources in targeting local markets and from new marketing channels that may displace the existing alarm system dealer channels for acquiring AMAs. This competition could reduce the acquisition opportunities available to Monitronics, thus slowing its rate of growth, or requiring it to increase the price it pays for such AMAs, thus reducing its return on investment and negatively impacting its revenues and results of operations. · acquire certain types of alarm monitoring contracts. Monitronics must also comply with certain financial covenants under the credit facility and the securitization facility. Credit facility covenants include those that relate to capital expenditure limits, maximum total Monitronics debt to EBITDA (as defined therein), maximum Monitronics fixed charge coverage ratio, and if we have not refinanced the securitization facility by June 30, 2012, a maximum recurring revenue leverage ratio. Securitization covenants include maximum total Monitronics debt to EBITDA ratio, a debt interest coverage ratio, attrition rate maximums and average recurring monthly revenue minimums. If Monitronics cannot comply with any of these financial covenants, it may not be able to make additional draw downs under the revolving credit facility. In addition, failure to comply with the restrictions contained in the credit facility or the securitization facility could lead to an event of default, which could result in the acceleration of a substantial amount of indebtedness. December 31, 2011, Funding held approximately $51 million in restricted cash, of which $28 million was held in an interest reserve account and $23 million was held in satisfaction of its other obligations under the securitization facility. Absent the repayment or refinancing of the securitization facility, Monitronics will not have access to the cash generated by the alarm monitoring contracts that support the securitization facility. While we expect Monitronics will be able to refinance or amend the terms of the securitization facility, there can be no assurances that such a refinancing or amendment will be available to Monitronics on terms acceptable to us or at all. If we do not refinance or repay the existing Monitronics securitization facility by July 2012, our borrowing costs under that facility will increase substantially and Monitronics access to the cash of its subsidiaries will be significantly reduced. If Monitronics does not refinance the securitization facility by July 2012, additional interest will begin to accrue at the rate of 5% per annum (including 0.5% of fees) on the two variable funding notes under the securitization facility, which have an aggregate principal balance of $288 million. The effective interest rate payable by the Company under $550 million notional amount of swaps relating to the term notes under the securitization facility would also increase by 5% per annum (including 0.5% of fees) beginning July 2012. Although such additional interest will not be payable in cash until all the securitization debt has been paid off, the increased leverage resulting from the accrual of such additional interest could reduce the amount of additional financing available to Monitronics and may therefore reduce Monitronics ability to acquire new subscriber accounts. Also, under the terms of the securitization facility, Funding currently pays Security for monitoring and servicing the subscriber accounts owned by Funding, at an effective rate of $12.00 per active subscriber account per month plus reimbursement for field service costs related to customer moves and certain cellular monitoring costs. As such fees exceed the aggregate out-of-pocket cost to Security of monitoring and servicing these subscriber accounts, the amount of this excess is available currently for distribution to Monitronics and may be used for other corporate purposes, including the purchase of additional subscriber accounts outside of the securitization facility. Funding also pays Monitronics a dealer marketing fee of 1.5x recurring monthly revenue for new alarm monitoring contracts purchased by Funding. Under the terms of the securitization facility, beginning July 2012, the amount of the monthly servicing fees payable by Funding to Security will decrease from a rate of $12.00 per active subscriber account per month to $7.50 per active subscriber account per month and the reimbursement for customer moves and cellular costs will be eliminated. Furthermore, the dealer marketing fee will be eliminated since Funding will no longer be permitted to purchase alarm monitoring contracts. These reductions will instead be used to make principal repayments at Funding and will substantially reduce or eliminate the excess cash that has been available at Security for distribution to Monitronics as well as the dealer marketing fee currently distributed to Monitronics. If Monitronics does not repay or refinance the securitization facility by July 2012, the decrease in servicing fees and elimination of marketing fees could have a substantially adverse effect on its liquidity and reduce the capital resources available to Monitronics for purchasing AMAs. While we expect Monitronics will be able to refinance or amend the terms of the securitization facility before July 2012, there can be no assurances that such a refinancing or amendment will be available to Monitronics on terms acceptable to us or at all. We may be unable to obtain additional funds to grow Monitronics business. Monitronics intends to continue to pursue growth through the acquisition of subscriber accounts through its authorized dealer program, among other means. To continue its growth strategy, Monitronics may be required to make additional draw downs under its credit facility, seek financing through new credit arrangements or the possible sale of new securities or refinance its existing securitization facility, any of which may lead to higher leverage or result in higher borrowing costs. An inability to obtain funding through external financing sources on favorable terms or at all is likely to adversely affect Monitronics ability to continue or accelerate its subscriber account acquisition activities. Monitronics rights to its intellectual property are invalid or unenforceable, and Monitronics cannot guarantee that these claims will be unsuccessful. Any claims involving rights to use the Monitronics mark could have a material adverse effect on the alarm monitoring business, if such claims were decided against Monitronics and it were precluded from using or licensing the Monitronics mark or others were allowed to use it. If Monitronics were required to adopt a new name, it would entail marketing costs in connection with building up recognition and goodwill in such new name. In the event that Monitronics was enjoined from using any of its other intellectual property, there would be costs associated with the replacement of such intellectual property with developed, acquired or licensed intellectual property. There would also be costs associated with the defense and settlement of any infringement or misappropriation allegations and any damages that may be awarded. Enactment of these measures could adversely affect Monitronics future operations and business. For example, numerous cities or metropolitan areas have implemented verified response ordinances for residential and commercial burglar alarms. A verified response policy means that police officers generally do not respond to an alarm until someone else (e.g., the resident, a neighbor or a security guard) first verifies that it is valid. Some alarm monitoring companies operating in these areas hire security guards or use third-party guard firms to verify an alarm. If Monitronics needs to hire security guards or use third-party guard firms, it could have a material adverse effect on its business through either increased servicing costs, which could negatively affect the ability of Monitronics to fund properly its ongoing operations, or increased costs to its customer, which may limit its ability to attract new customers or increase our subscriber attrition rates. In addition, the perception that police departments will not respond to third-party monitored burglar alarms, may reduce customer satisfaction with traditional monitored alarm systems, which may also result in increased attrition rates or decreased customer demand. Although Monitronics has less than 35,000 subscribers in these areas, a more widespread adoption of such a policy or similar policies in other cities or municipalities could materially and adversely affect its business. Monitronics business operates in a regulated industry. Monitronics business, operations and employees are subject to various U.S. federal, state and local consumer protection, licensing and other laws and regulations. While there are no U.S. federal laws that directly regulate the security alarm monitoring industry, the advertising and sales practices of Monitronics are subject to regulation by the U.S. Federal Trade Commission in addition to state consumer protection laws that have general application that extend to Monitronics business. Most states in which Monitronics operates have licensing laws directed specifically toward the monitored security services industry. Monitronics business relies heavily upon wireline and cellular telephone service to communicate signals. Wireline and cellular telephone companies are currently regulated by both federal and state governments. Changes in laws or regulations could require Monitronics to change the way it operates, which could increase costs or otherwise disrupt operations. In addition, failure to comply with any applicable laws or regulations could result in substantial fines or revocation of Monitronics operating permits and licenses. If laws and regulations were to change or Monitronics failed to comply, Monitronics business, financial condition and results of operations could be materially and adversely affected. Increased adoption of statutes and governmental policies purporting to void automatic renewal provisions in the AMAs, or purporting to characterize certain charges in the AMAs as unlawful, could adversely affect Monitronics business and operations. The AMAs typically contain provisions automatically renewing the term of the contract at the end of the initial term, unless a cancellation notice is delivered in accordance with the terms of the contract. If the customer cancels prior to the end of the contract term, other than in accordance with the contract, Monitronics may charge the customer the amounts that would have been paid over the remaining term of the contract, or charge an early cancellation fee. Several states have adopted, or are considering the adoption of, consumer protection policies or legal precedents which purport to void or substantially limit the automatic renewal provisions of contracts such as the AMAs, or otherwise restrict the charges that can be imposed upon contract cancellation. Such initiatives could negatively impact Monitronics business. Adverse judicial determinations regarding these matters could increase legal exposure to customers against whom such charges have been imposed, and the risk that certain customers may seek to recover such charges through litigation. In addition, the costs of defending such litigation and enforcement actions could have an adverse effect on Monitronics business and operations. Currently, the Company leases approximately 90,000 square feet in California and 20,000 square feet in New York. All locations are 100% subleased to third parties. The Company leases approximately 35,000 square feet in New Jersey and the space is being marketed for sublease. The Company leases approximately 4,000 square feet in Colorado. In addition, the Company owns approximately 290,000 square feet of real estate of which approximately 270,000 square feet is leased to third parties. The Company is currently exploring opportunities to dispose of or monetize such real property. Monitronics leases approximately 110,000 square feet in Dallas, Texas to house its executive offices, monitoring center, sales and marketing and data retention functions. Approximately 98,000 square feet of the 110,000 square feet is under an eleven-year lease expiring May 31, 2015 and 12,000 square feet is under a seven-year lease expiring January 31, 2015. Monitronics also leases approximately 13,000 square feet for the McKinney, Texas back-up monitoring facility. Our Series A common stock trades on the NASDAQ Global Select Market under the symbol ASCMA. Our Series B common stock is eligible for quotation on the OTC Bulletin Board under the symbol ASCMB, but it is not actively traded. The following table sets forth the quarterly range of high and low sales prices of shares of our Series A common stock for the years ended December 31, 2011 and 2010. High and low bid information for our Series B common stock is not available. As of January 31, 2012, there were approximately 1,121 and 64 record holders of our Series A common stock and Series B common stock, respectively (which amounts do not include the number of shareholders whose shares are held of record by banks, brokerage houses or other institutions, but include each institution as one shareholder). Information required by this item is incorporated by reference to our definitive proxy statement for our 2012 Annual Meeting of shareholders. NASDAQ Stock Market Index over the same period. The graph assumes $100 was originally invested on September 18, 2008 and that all subsequent dividends were reinvested in additional shares. (1) Represents shares withheld in payment of withholding taxes by certain of our executive officers upon vesting of their restricted share awards. (2) On June 16, 2011 the Company announced that it received authorization to implement a stock repurchase program, pursuant to which it may purchase up to $25,000,000 of its shares of Series A Common Stock from time to time. As of December 31, 2011, up to $13,512,000 of Series A Common Stock remains to be purchased under the program. (a) Includes impairment of goodwill of $165,347,000 for the year ended December 31, 2007. This impairment charge is included in discontinued operations as it relates to the Content Services group which is included in discontinued operations for all periods presented. (b) Includes impairment of goodwill of $95,069,000 for the year ended December 31, 2008. This impairment charge relates to the Creative/Media business which is included in discontinued operations for all periods presented. (c) Includes a gain on the sale of Content Distribution of $66,136,000 and related income tax expense of $2,906,000 for the year ended December 31, 2011. The gain and related tax expense is included in discontinued operations for all periods presented. (d) Basic and diluted net income (loss) per common share is based on (1) the actual number of basic and diluted shares for all periods subsequent to the spin off and (2) 14,061,618 shares, which is the number of shares issued in the spin off, for 2007. At December 31, 2011, our assets consisted primarily of our wholly-owned operating subsidiary, Monitronics International, Inc. (Monitronics). On December 17, 2010, we signed and closed an agreement to acquire 100% of the outstanding capital stock of Monitronics, through the merger of our wholly owned subsidiary, Mono Lake Merger Sub, Inc., with and into Monitronics, with Monitronics surviving such merger. The cash consideration paid in connection with the merger was $397,088,000. We also assumed approximately $795,000,000 in net debt (which we define as the principal amount of such debt less Monitronics cash) of Monitronics. In connection with the acquisition, Monitronics entered into a credit agreement, which provides for a $60,000,000 term loan and a $115,000,000 revolving credit facility. Ascent Capital has guaranteed payment of the term loan up to the first $30,000,000 of obligations thereunder. At closing, Monitronics borrowed the full amount of the term loan and $45,000,000 under the revolving credit facility, for total initial borrowings under the credit facility of $105,000,000. The proceeds of such loans, after repayment of $5,000,000 outstanding under a previously existing credit facility, and payment of certain fees and expenses relating to the credit facility, were used to fund a portion of the aggregate merger consideration payable in connection with the acquisition of Monitronics. The remaining cash consideration paid was funded by cash on hand. Monitronics is primarily engaged in the business of providing security alarm monitoring services: monitoring signals from burglaries, fires, medical alerts, and other events, as well as providing customer service and technical support. Nearly all of its revenues are derived from monthly recurring revenues under security alarm monitoring contracts purchased from independent dealers in its exclusive nationwide network. Revenues are recognized as the related monitoring services are provided. Other revenues are derived primarily from the provision of third-party contract monitoring services and from field technical repair services. All direct external costs associated with the creation of subscriber accounts are capitalized and amortized over fifteen years using a 220% declining balance method beginning in the month following the date of purchase. Internal costs, including all personnel and related support costs incurred solely in connection with subscriber account acquisitions and transitions, are expensed as incurred. Account cancellation, otherwise referred to as subscriber attrition, has a direct impact on the number of subscribers that Monitronics services and on its financial results, including revenues, operating income and cash flow. A portion of the subscriber base can be expected to cancel its service every year. Subscribers may choose not to renew or terminate their contract for a variety of reasons, including relocation, cost, switching to a competitors service, and service issues. The largest category of canceled accounts relate to subscriber relocation or the inability to contact the subscriber. Monitronics defines its attrition rate as the number of canceled accounts in a given period divided by the weighted average of subscribers for that period. Monitronics considers an account canceled when a subscriber terminates in accordance with the terms of the contract or if payment from the subscriber is deemed uncollectible. If a subscriber relocates but continues its service, this is not a cancellation. If the subscriber relocates, discontinues its service and a new subscriber takes over the original subscribers service continuing the revenue stream (a new owner takeover), this is also not a cancellation. Monitronics adjusts the number of canceled accounts by excluding those that are contractually guaranteed by its dealers. The typical dealer contract provides that if a subscriber cancels in the first year of its contract, the dealer must either replace the canceled account with a new one or refund the purchase price. To help ensure the dealers obligation to Monitronics, Monitronics holds back a portion of the purchase price for every account purchased, typically 5-10%. In some cases, the amount of the purchase holdback may be less than actual attrition experience. (a) Net of canceled accounts that are contractually guaranteed by the dealer. Monitronics also analyzes its attrition by classifying accounts into annual pools based on the year of purchase. Monitronics then tracks the number of accounts that cancel as a percentage of the initial number of accounts purchased for each pool for each year subsequent to its purchase. Based on the average cancellation rate across the pools, in recent years Monitronics has averaged less than 1% attrition within the initial 12-month period after considering the accounts which were replaced or refunded by the dealers at no additional cost to Monitronics. Over the next three years of the subscriber account life, the number of subscribers that cancel as a percentage of the initial number of subscribers in that pool gradually increases and historically has peaked between the third and fourth years. The peak between the third and fourth years is primarily a result of the buildup of subscribers that moved or no longer had need for the service prior to the third year but did not cancel their service until the end of their three-year contract. After the fourth year, the number of subscribers that cancel as a percentage of the initial number of subscribers in that pool declines. Beginning in the first quarter of 2011, Ascent Capital changed one of the key financial measures that it uses to evaluate its performance. Ascent Capital now uses net income (loss) before interest expense, interest income, income taxes, depreciation, amortization (including the amortization of subscriber accounts and dealer network), realized and unrealized gain/(loss) on derivative instruments, non-cash or non-recurring restructuring charges and stock-based and other non-cash long-term incentive compensation (which is referred to as Adjusted EBITDA) instead of adjusted operating income before depreciation and amortization, and stock-based and other non-cash long-term incentive compensation (which is referred to as Adjusted OIBDA). Ascent Capital made this change as a result of the sale of most of its historical operating subsidiaries and the acquisition of Monitronics, a security alarm monitoring company, which is now its primary operating subsidiary. Financial information for prior periods has been revised to retrospectively reflect Ascent Capitals change in this financial measure. Ascent Capital believes that Adjusted EBITDA is an important indicator of the operational strength and performance of its business, including the business ability to fund its ongoing acquisition of subscriber accounts, its capital expenditures and to service its debt. In addition, this measure is used by management to evaluate operating results and perform analytical comparisons and identify strategies to improve performance. Adjusted EBITDA is also a measure that is customarily used by financial analysts to evaluate the financial performance of companies in the security alarm monitoring industry and is one of the financial measures, subject to certain adjustments, by which covenants are calculated under the agreements governing Monitronics debt obligations. Adjusted EBITDA does not represent cash flow from operations as defined by generally accepted accounting principles, should not be construed as an alternative to net income or loss and is indicative neither of our results of operations nor of cash flows available to fund all of our cash needs. It is, however, a measurement that Ascent Capital believes is useful to investors in analyzing its operating performance. Accordingly, Adjusted EBITDA should be considered in addition to, but not as a substitute for, net income, cash flow provided by operating activities and other measures of financial performance prepared in accordance with GAAP. Adjusted EBITDA is a non-GAAP financial measure. As companies often define non-GAAP financial measures differently, Adjusted EBITDA as calculated by Ascent Capital should not be compared to any similarly titled measures reported by other companies. The following table sets forth selected data from the accompanying consolidated statements of operations for the periods indicated. The results of operations for Monitronics are included from December 17, 2010, the date of acquisition (dollar amounts in thousands). Net revenue. Revenue increased $302,769,000 and $9,129,000 for the years ended December 31, 2011 and 2010, respectively, as compared to the corresponding prior year. Revenue is generated from alarm monitoring operations within the Monitronics business, which was acquired on December 17, 2010. The 2011 increase in revenue is primarily attributable to a full years operations in 2011 as compared to 15 days in 2010. Furthermore, 2011 revenue increased as a result of a 7.1% increase in monthly weighted average subscriber accounts from 643,157 for the twelve months ended December 31, 2010 to 688,774 for the twelve months ended December 31, 2011. As Ascent Capital did not own Monitronics in 2009, there was no revenue for the respective period as businesses existing in 2009 have been included in discontinued operations. Cost of Services. Cost of services increased $39,131,000 and $1,422,000 for the years ended December 31, 2011 and 2010, respectively, as compared to the corresponding prior year. Cost of services includes costs incurred from alarm monitoring operations within the Monitronics business, which was acquired on December 17, 2010. The 2011 increase in cost of services is attributable to a full years operations in 2011 as compared to 15 days in 2010. As Ascent Capital did not own Monitronics in 2009, there was no cost of services for the respective period as businesses existing in 2009 have been included in discontinued operations. Selling, General and Administrative. Selling, general and administrative expense (SG&A) was $76,845,000, $30,314,000 and $27,451,000 for the years ended December 31, 2011, 2010 and 2009, respectively. SG&A expense increased $46,531,000 and $2,863,000 for the years ended December 31, 2011 and 2010, respectively, as compared to the corresponding prior year. 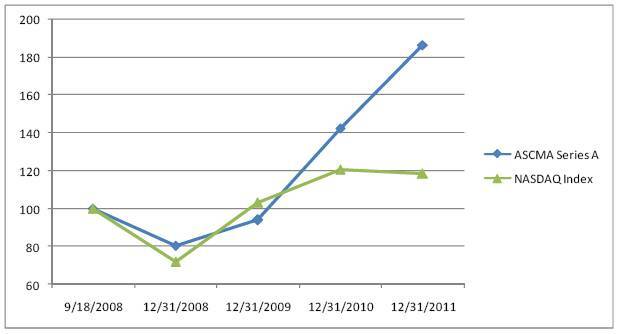 For 2011, the increase was mainly due to increased SG&A expense related to Monitronics, which was acquired on December 17, 2010. Monitronics SG&A expenses were $57,170,000 for the year ended December 31, 2011 as compared to $2,130,000 for the year ended December 31, 2010. For 2010, the increase was mainly due to SG&A expenses from the Monitronics business which was acquired on December 17, 2010, increased stock-based compensation and long-term incentive compensation of $1,781,000, and transaction costs related to the acquisition of Monitronics of approximately $1,300,000. The increases in 2011 and 2010 were partially offset by lower labor and other administrative costs, which declined due to the implementation of restructuring and cost mitigation measures. year ended December 31, 2010, was related to restricted stock, stock options and cash distributions for awards granted in 2010 under the amended 2006 Long-Term Incentive Plan (2006 LTIP). In addition, the 2010 amount also includes approximately $425,000 of accelerated vesting of restricted stock and stock options related to the death benefits of our chief operating officer pursuant to the terms of the Ascent Capital Group, Inc. 2008 Incentive Plan. The expense for the year ended December 31, 2009, was related to restricted stock and stock option awards granted to certain executives. Amortization of Subscriber Accounts and Dealer Network. Amortization expense was $159,619,000 and $5,980,000 for the years ended December 31, 2011 and 2010, respectively. For 2011, the increase in amortization expense of $153,639,000 is primarily due to a full years amortization occurring in 2011 as compared to 15 days in 2010. The Company had no such assets in 2009, thus no amortization was recorded for that year. Restructuring Charges. During 2011, 2010 and 2009, we completed certain restructuring activities and recorded charges of $4,258,000, $4,604,000 and $695,000, respectively, which relate to our continuing operations. In the fourth quarter of 2010, we began a new restructuring plan (the 2010 Restructuring Plan) in conjunction with the expected sales of the Creative/Media and Content Distribution businesses. The 2010 Restructuring Plan was implemented to meet the changing strategic needs of the Company as we sold most of our media and entertainment services assets and acquired Monitronics, an alarm monitoring business. Such charges included retention costs for employees to remain employed until the sales are complete, severance costs for certain employees that were not retained by the buyers and facility costs that were no longer being used by us due to the sales. Before we implemented the 2010 Restructuring Plan, we had just completed a restructuring plan that was implemented in 2008 and concluded in September 2010 (the 2008 Restructuring Plan). The 2008 Restructuring Plan was implemented to align our organization with our strategic goals and how we operate, manage and market our services. The 2008 Restructuring Plan charges included severance costs from labor cost mitigation measures undertaken across all of the businesses and facility costs in conjunction with the consolidation of certain facilities in the United Kingdom and the closing of our Mexico operations. The following table provides the activity and balances of the 2010 Restructuring Plan and the 2008 Restructuring Plan. (a) Primarily represents cash payments. (b) Substantially all of this amount is expected to be paid in 2012. Depreciation. Depreciation expense was $7,052,000, $3,067,000 and 4,259,000 for the years ended December 31, 2011, 2010, and 2009, respectively. Depreciation expense increased $3,985,000 and decreased $1,192,000 for the years ended December 31, 2011 and 2010, respectively, as compared to the corresponding prior year. The increase in 2011 is mainly due to depreciation expense related to Monitronics assets which were acquired on December 17, 2010. The 2010 decrease in depreciation expense is due to decreased corporate assets as compared to the prior year, partially offset by deprecation of property and equipment acquired in the Monitronics acquisition. Interest Expense. Interest expense was $42,813,000, $2,672,000, and $102,000 for the years ended December 31, 2011, 2010, and 2009, respectively. The increase in 2011 interest expense of $40,141,000 and $2,570,000 as compared to the respective prior year is due to the increase in debt associated with the acquisition of Monitronics on December 17, 2010. Interest expense includes amortization of debt discount of $16,985,000 and $780,000 for the years ended December 31, 2011 and 2010. Realized and unrealized loss on derivative financial instruments. Realized and unrealized loss on derivative financial instruments was $10,601,000, $1,682,000, and $0 for the years ended December 31, 2011, 2010, and 2009, respectively. The increase in 2011 is attributable to a full years operations in 2011 as compared to 15 days in 2010. For year ended December 31, 2011, the realized and unrealized loss on derivative financial instruments in the consolidated statements of operations includes settlement payments of $38,645,000 partially offset by a $28,044,000 unrealized gain related to the change in the fair value of these derivatives. For year ended December 31, 2010, the realized and unrealized loss on derivative financial instruments in the consolidated statements of operations includes settlement payments of $1,504,000 partially and a $178,000 unrealized loss related to the change in the fair value of these derivatives. As the Company did not have derivative financial instruments in 2009, there was no related realized and unrealized loss on derivative financial instruments for that year. expense from continuing operations of $270,000. For the year ended December 31, 2009, we had a pre-tax loss from continuing operations of $27,084,000 and an income tax expense from continuing operations of $28,721,000. The Company incurred tax expense for the year ended December 31, 2009 due to the establishment of a valuation allowance against its deferred tax assets. In 2011 and 2010, the Company continues to have a valuation allowance against its deferred tax assets. Earnings from Discontinued Operations, Net of Income Taxes. We recorded earnings (losses) from discontinued operations, net of income taxes of $48,789,000, $(4,993,000) and $2,908,000 for the years ended December 31, 2011, 2010 and 2009, respectively. These amounts included the earnings of the discontinued operations and the gain or loss on the sales. See further information about the discontinued operations below. Adjusted EBITDA. The following table provides a reconciliation of total Adjusted EBITDA to loss from continuing operations before income taxes. The Monitronics business Adjusted EBITDA as a percentage of revenue was 68.8% and 61.1% for the years ended December 31, 2011 and 2010, respectively. The Monitronics business Adjusted EBITDA was $214,485,000 and $5,577,000 for the years ended December 31, 2011 and 2010, respectively. The following businesses have been treated as discontinued operations in the consolidated financial statements for all periods presented. As discussed above, the Company shut down the operations of the Systems Integration business in June 2011. In connection with ceasing its operations, the Company recorded exit costs of $1,119,000 related to employee severance. As discussed above, the Company sold the Content Distribution business to Encompass on February 28, 2011. We recorded a pre-tax gain on the sale of $66,136,000 and income tax expense of $2,906,000. The gain and related income tax expense are included in income (loss) from discontinued operations in the accompanying condensed consolidated statement of operations for the year ended December 31, 2011. As discussed above, the Company sold the Creative/Media business to Deluxe on December 31, 2010. We recorded a pre-tax loss on the sale of $27,110,000 and an income tax benefit of $7,587,000. The loss and related income tax benefit are included in income (loss) from discontinued operations in the accompanying condensed consolidated statement of operations for the year ended December 31, 2010. In September 2010, the Company shut down the operations of the Global Media Exchange (GMX), which was previously included in the Content Services group. Ascent Capital recorded a charge of $1,838,000 to write off the assets and recorded severance costs in connection with the shutdown for the year ended December 31, 2010. In February 2010, the Company completed the sale of the assets and operations of the Chiswick Park facility in the United Kingdom, which was previously included in the Content Services group, to Discovery Communications, Inc. The net cash proceeds on the sale were $34,800,000. We recorded a pre-tax gain on the sale of $25,498,000 and $3,423,000 of related income tax expense. The gain and related income tax expense are included in income (loss) from discontinued operations in the accompanying condensed consolidated statement of operations for the year ended December 31, 2010. At December 31, 2011, we have $183,558,000 of cash and cash equivalents, $31,196,000 of current restricted cash, and $40,377,000 of marketable securities. We may use a portion of these assets to decrease debt obligations, fund stock repurchases, or fund potential strategic acquisitions or investment opportunities. Additionally, our other source of funds is our cash flows from operating activities. In 2011, the operating cash flows were primarily generated from the operations of Monitronics, which was acquired in December 2010. In 2010 and in prior years, the operating cash flows were primarily generated from the Creative/Media, Content Distribution and Systems Integration businesses. Since we have sold both the Creative/Media and Content Distribution business and shutdown the operations of the Systems Integration business, future operating cash flows will be generated almost entirely from the operations of Monitronics. During the years ended December 31, 2011, 2010 and 2009, our cash flow from operating activities was $131,238,000, $50,300,000 and $35,974,000, respectively. The primary driver of our cash flow from operating activities is Adjusted EBITDA. Fluctuations in our Adjusted EBITDA are discussed in Results of Operations above. In addition, our cash flow from operating activities may be significantly impacted by changes in working capital. During the years ended December 31, 2011 and 2010, we used cash of $162,714,000 and $4,214,000, respectively, to fund purchases of subscriber accounts. In addition, during the years ended December 31, 2011, 2010 and 2009, we used cash of $4,242,000, $139,000 and $1,420,000, respectively, to fund our capital expenditures. In December 2010, we paid cash of $388,401,000 to acquire Monitronics, net of Monitronics cash on hand of $7,475,000, to fund a portion of the purchase price on Monitronics. On June 16, 2011, our Board of Directors authorized the repurchase of up to $25,000,000 of our Series A common stock. During 2011, we repurchased 269,659 shares of our Series A common stock at an average purchase price of $42.60 per share for a total of approximately $11,488,000 pursuant to this authorization. These shares were returned to authorized and unissued, reducing the number of our shares outstanding. During 2011, we purchased marketable securities primarily consisting of diversified corporate bond funds for cash of $40,253,000 in order to improve our investment rate of return. During 2010, we purchased marketable securities consisting of diversified corporate bond funds for cash of $41,757,000 and sold all of the marketable securities we held in December 2010 for cash proceeds of $96,685,000 to fund the acquisition of Monitronics. During 2009, we purchased marketable securities consisting of diversified corporate bond funds for cash of $68,126,000 in order to improve our investment rate of return. We sold a portion of these securities for cash proceeds of $16,309,000. covenants which include maximum leverage ratios and minimum fixed charge coverage ratios, and beginning June 30, 2012 will become subject to a recurring monthly revenue leverage ratio. Ascent Capital guaranteed $30,000,000 of the aggregate principal amount of the term loan outstanding under the Credit Facility. In considering our liquidity requirements for 2012, we evaluated our known future commitments and obligations. We will require the availability of funds to finance the strategy of Monitronics, our primary operating subsidiary, which is to grow through subscriber account purchases. In addition, additional cash will be needed to meet Monitronics debt service obligations on its long-term debt, any settlement of Monitronics derivative financial instruments in advance of their scheduled terms, and capital expenditures. We also considered the expected cash flow from Monitronics, as this business will be the primary driver of our operating cash flows. In addition, we considered the borrowing capacity of Monitronics Credit Facility, under which Monitronics could borrow approximately $49,700,000 as of December 31, 2011. Based on this analysis, we expect that cash on hand, cash flow generated from operations and borrowings under the Monitronics Credit Facility will provide sufficient liquidity, given our anticipated current and future requirements. The existing long-term debt of Monitronics at December 31, 2011 includes the principal balance of $838 million under a securitization facility. The Class A-1 term notes issued under the securitization facility in the aggregate outstanding principal amount of $450,000,000 are due in full on July 15, 2027; all other notes issued under the facility, including the variable funding notes described below, are due on July 15, 2037. However, certain terms of such securitization facility may impact our liquidity and capital structure in 2012. As of December 31, 2011, alarm monitoring agreements for approximately 616,000 of Monitronics subscriber accounts are owned by Monitronics Funding LP, a subsidiary of Monitronics, which we refer to as Funding. Such alarm monitoring agreements, and the monthly recurring revenue and other proceeds thereof, are pledged as collateral to secure the obligations of Monitronics under the securitization facility. Under the terms of such facility, Issuer currently pays Monitronics Security LP (another subsidiary of Monitronics, which we refer to as Security) for monitoring and servicing the subscriber accounts owned by Funding, at an effective rate of $12.00 per active subscriber account plus reimbursement for field service costs related to customer moves and certain cellular monitoring cost. Fees paid from Funding to Security can be distributed to Monitronics, but cash balances at Funding must be used to service the securitization indebtedness. As the servicing fees paid by Funding to Security currently exceed the aggregate out-of-pocket costs of monitoring and servicing such subscriber accounts, the amount of such excess is available to Monitronics for other corporate purposes, including the purchase of additional subscriber accounts. However, under the terms of the securitization facility, effective July 2012, the amount of the servicing fees payable by Funding to Security will decrease from an effective rate of $12.00 per active subscriber account to $7.50 per active subscriber account and the reimbursement for field service costs related to customer moves and certain cellular monitoring cost will be eliminated. This decrease will substantially reduce or eliminate the excess cash available to Security for distribution to Monitronics. Accordingly, if Monitronics does not repay or refinance the securitization facility by July 2012, the decrease in fees could have a substantially adverse effect on our liquidity and reduce the capital resources available to Monitronics for purchasing alarm monitoring accounts. Monitronics is currently exploring opportunities to refinance or amend the terms of its securitization facility to avoid such potential adverse effects on its liquidity and capital resources. While we expect Monitronics will be able to refinance or amend the terms of the securitization facility before July 2012, there can be no assurances that such a refinancing or amendment will be available to Monitronics on terms acceptable to us, or on any terms. In addition, if Monitronics does not repay or refinance the securitization facility by July 2012, contingent additional interest will begin to accrue at the rate of 5% per annum (including 0.5% of fees) on the two variable funding notes (or VFNs) under the securitization facility, which have an aggregate principal balance of $288,000,000. The effective interest rate payable by Monitroinics under $550 million notional amount of swaps relating to the term notes under the securitization facility would also increase by 5% per annum (including 0.5% of fees) beginning July 2012, if such swaps are then outstanding. Although such additional interest will not be payable in cash until all of the securitization debt has been paid off, the accrued amount would reduce the borrowing base available to Monitronics under its new credit facility and may indirectly reduce Monitronics ability to acquire new subscriber accounts. (a) Amounts reflect principal amounts owed and therefore excludes discount of $10,582,000. Amounts also exclude interest payments which are based on variable interest rates. Valuation of Subscriber Accounts. Subscriber accounts, which totaled $838,441,000 at December 31, 2011, relate to the cost of acquiring portfolios of monitoring service contracts from independent dealers. The subscriber accounts acquired in the Monitronics acquisition were recorded at fair value under the acquisition method of accounting. Subscriber accounts purchased subsequent to the acquisition are recorded at cost. All direct external costs associated with the creation of subscriber accounts are capitalized. Internal costs, including all personnel and related support costs, incurred solely in connection with subscriber account acquisitions and transitions are expensed as incurred. The costs of subscriber accounts acquired in the Monitronics acquisition are amortized using the 14-year 235% declining balance method. The costs of subscriber accounts acquired subsequent to the acquisition are amortized using the 15-year 220% declining balance method, beginning in the month following the date of purchase. The amortization methods were selected to provide an approximate matching of the amortization of the subscriber accounts intangible asset to estimated future subscriber revenues based on the projected lives of individual subscriber contracts. The realizable value and remaining useful lives of these assets could be impacted by changes in subscriber attrition rates, which could have an adverse effect on our earnings. We review the subscriber accounts for impairment or a change in amortization period whenever events or changes indicate that the carrying amount of the asset may not be recoverable or the life should be shortened. For purposes of recognition and measurement of an impairment loss, we view subscriber accounts as a single pool because of the assets homogeneous characteristics, and because the pool of subscriber accounts is the lowest level for which identifiable cash flows are largely independent of the cash flows of the other assets and liabilities. This treatment results from the due diligence program that we have implemented in which a contract must meet certain purchase criteria before we purchase the account. All of our customers contract for essentially the same service and we are consistent in providing that service regardless of the customers locations. If we determine that an impairment has occurred, we write the subscriber accounts down to their fair value. recognize impairment if the carrying amount of a long-lived asset or intangible asset is not recoverable from its undiscounted cash flows in accordance with the Property, Plant and Equipment Topic of the FASB ASC. Impairment is measured as the difference between the carrying amount and the fair value of the asset. We use both the income approach and market approach to estimate fair value. Our estimates of fair value are subject to a high degree of judgment since they include a long-term forecast of future operations. Accordingly, any value ultimately derived from our long-lived assets may differ from our estimate of fair value. Valuation of Trade Receivables. We must make estimates of the collectability of our trade receivables. We perform extensive credit evaluations on the portfolios of subscriber accounts prior to purchase and require no collateral on the accounts that are acquired. We establish an allowance for doubtful accounts for estimated losses resulting from the inability of subscribers to make required payments. Factors such as historical-loss experience, recoveries and economic conditions are considered in determining the sufficiency of the allowance to cover potential losses. Our trade receivables balance was $10,973,000, net of allowance for doubtful accounts of $1,815,000, as of December 31, 2011. As of December 31, 2010, our trade receivables balance was $11,092,000, net of allowance for doubtful accounts of $250,000. Valuation of Deferred Tax Assets. In accordance with the Income Taxes Topic of the FASB ASC, we review the nature of each component of our deferred income taxes for the ability to realize the future tax benefits. As part of this review, we rely on the objective evidence of our current performance and the subjective evidence of estimates of our forecast of future operations. Our estimates of realizability are subject to a high degree of judgment since they include such forecasts of future operations. After consideration of all available positive and negative evidence and estimates, we have determined that it is more likely than not that we will not realize the tax benefits associated with our United States deferred tax assets and certain foreign deferred tax assets, and as such, we have a valuation allowance which totaled $29,248,000 and $33,347,000 as of December 31, 2011 and 2010, respectively. Valuation of Goodwill. As of December 31, 2011, we had goodwill of $349,227,000, which represents approximately 21% of total assets. This goodwill was recorded in connection with the acquisition of Monitronics on December 17, 2010. We are required to test goodwill annually for impairment and record an impairment charge if the carrying amount exceeds the fair value. Recoverability of goodwill for the reporting unit is measured using a discounted cash flow model incorporating discount rates commensurate with the risks involved, which is classified as a Level 3 measurement under FASB ASC Topic 820, Fair Value Measurements and Disclosures. The key assumptions used in the discounted cash flow valuation model include discount rates, growth rates, cash flow projections and terminal value rates. Discount rates, growth rates and cash flow projections are the most sensitive and susceptible to change as they require significant management judgment. We continually monitor our economic exposure to changes in foreign exchange rates and may enter into foreign exchange agreements where and when appropriate. Substantially all of our foreign transactions are denominated in foreign currencies, including the liabilities of our foreign subsidiaries. Although our foreign transactions are not generally subject to significant foreign exchange transaction gains or losses, the financial statements of our foreign subsidiaries are translated into United States dollars as part of our consolidated financial reporting. As a result, fluctuations in exchange rates affect our financial position and results of operations. associated with variable interest rates on the debt obligations. We do not use derivative financial instruments for trading purposes. (a) The average interest rate paid on the Swaps is 6.48% and the average interest rate received is the 1-month LIBOR rate plus 0.9%. In accordance with Exchange Act Rules 13a-15 and 15d-15, the Company carried out an evaluation, under the supervision and with the participation of management, including its chairman, president and principal accounting officer (the Executives), of the effectiveness of its disclosure controls and procedures as of the end of the period covered by this report. Based on that evaluation, the Executives concluded that the Companys disclosure controls and procedures were effective as of December 31, 2011 to provide reasonable assurance that information required to be disclosed in its reports filed or submitted under the Exchange Act is recorded, processed, summarized and reported within the time periods specified in the Securities and Exchange Commissions rules and forms. There has been no change in the Companys internal control over financial reporting identified during the three months ended December 31, 2011 that has materially affected, or is reasonably likely to materially affect, its internal control over financial reporting. The Company assessed the design and effectiveness of internal control over financial reporting as of December 31, 2011. In making this assessment, management used the criteria set forth by the Committee of Sponsoring Organizations of the Treadway Commission (COSO) in Internal ControlIntegrated Framework . Based upon our assessment using the criteria contained in COSO, management has concluded that, as of December 31, 2011, Ascent Capitals internal control over financial reporting is effectively designed and operating effectively. The effectiveness of our internal control over financial reporting as of December 31, 2011 has been audited by KPMG LLP, the independent registered public accounting firm that audited our financial statements. Their report appears on page 38 of this Annual Report on Form 10-K.
We have audited the internal control over financial reporting of Ascent Capital Group, Inc. as of December 31, 2011, based on criteria established in Internal Control  Integrated Framework issued by the Committee of Sponsoring Organizations of the Treadway Commission (COSO). Management of the Company is responsible for maintaining effective internal control over financial reporting and for its assessment of the effectiveness of internal control over financial reporting, included in the accompanying Managements Report on Internal Control over Financial Reporting in Item 9A. Our responsibility is to express an opinion on the Companys internal control over financial reporting based on our audit. In our opinion, Ascent Capital Group, Inc. maintained, in all material respects, effective internal control over financial reporting as of December 31, 2011, based on criteria established in Internal Control  Integrated Framework issued by COSO. We also have audited, in accordance with the standards of the Public Company Accounting Oversight Board (United States), the consolidated balance sheets of Ascent Capital Group, Inc. and subsidiaries as of December 31, 2011 and 2010, and the related consolidated statements of operations and comprehensive income (loss), cash flows and stockholders equity for each of the years in the three-year period ended December 31, 2011, and our report dated February 29, 2012 expressed an unqualified opinion on those consolidated financial statements. We have audited the accompanying consolidated balance sheets of Ascent Capital Group, Inc. and subsidiaries as of December 31, 2011 and 2010, and the related consolidated statements of operations and comprehensive income (loss), cash flows and stockholders equity for each of the years in the three-year period ended December 31, 2011. These consolidated financial statements are the responsibility of the Companys management. Our responsibility is to express an opinion on these consolidated financial statements based on our audits. In our opinion, the consolidated financial statements referred to above present fairly, in all material respects, the financial position of Ascent Capital Group, Inc. and subsidiaries as of December 31, 2011 and 2010, and the results of their operations and their cash flows for each of the years in the three-year period ended December 31, 2011, in conformity with U.S. generally accepted accounting principles. We also have audited, in accordance with the standards of the Public Company Accounting Oversight Board (United States), Ascent Capital Group, Inc.s internal control over financial reporting as of December 31, 2011, based on criteria established in Internal Control  Integrated Framework issued by the Committee of Sponsoring Organizations of the Treadway Commission (COSO), and our report dated February 29, 2012 expressed an unqualified opinion on the effectiveness of the Companys internal control over financial reporting.